After two days of EuroBasket Women competition in Bydgoszcz all the big teams have wins under their belts. Belarus, the Czech Republic and Lithuania are already assured a place in the qualifying round with two wins each. Russia, one of the pre-tournament favourites, have been struggling to find their form and were beaten by Lithuania (64-76). However due to the fact that Turkey beat the Slovak Republic, Russia have qualified for the next round. In their final group match they meet Turkey and the outcome of this match is important because the loser will start the qualifying round with no wins to their name. The Slovak Republic became the first team to be eliminated and their final match against Lithuania has no effect on the rest of the competition. In Group B - as expected - Belarus and the Czech Republic have dominated and face each other on the third day of the preliminary round to determine who wins the group and goes into the qualification round with maximum points. 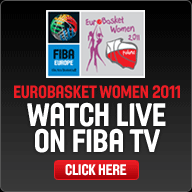 The two nations played each other in the semi-final of the 2010 FIBA World Championship for Women, a game won by the Czech Republic. Israel and Great Britain face off in a winner-takes-all match with elimination for the losing team. Whatever the outcome of this game, a new line of EuroBasket history will be written for the winners.